Kitsap Tours, which introduced visitors to Bainbridge Island and the peninsulas for five years, is shutting down this winter. Owners Jean and Jim Boyle have decided to “re-retire,” according to a post on the company website. The couple plans to spend more time… travelling. “We have decided to trade our bus for a camper van and spend some of our time exploring the back roads of this beautiful country and Canada while maintaining our home base here in Suquamish,” Jean Boyle wrote on the website. The news wasn’t unexpected. The Boyles put the business up for sale last year and said 2014 would be their last season. During its half-decade in operation, Kitsap Tours drew visitors from all 50 states and “introduced thousands of people to the natural beauty, history and charm of the area,” Jean Boyle wrote. 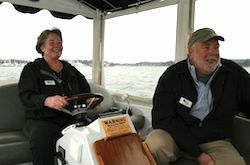 Here’s our story and video from the launch of Kitsap Tours in 2010.